my bare cupboard: Yaki-udon ( Fried udon noodles ) "
With all the books that I've carted from the library lately , I ask myself ( Yeah , I'm fond of talking to myself , good thing that I'm only doing it at home heh ! ) what's the purpose of it all if you won't try even one simple dish ? Some of those books were a tad heavy and sometimes my right shoulder has been complaining incessantly . Still , I just can't resist to carry one , okay , three every time I go to the library . I even asked my friend last time to borrow 2 more since I used up my 8 book limit ugh ! I'm not really impressed with it though . It's the color of the noodles , I think . I love to add dark soy sauce to most of my stir fried noodles , so this yaki-udon doesn't look impressive to my eyes . Let's be honest , it tastes so-so ! I should have tweaked the recipe . It certainly needs a good lashing of homemade chili sauce . To each their own taste . I'm used to adding some seasoning I have on hand every time I cook my version of stir fried udon . Beside light and dark soy sauce , I usually add chili sauce , fish sauce , even brown sugar . Don't get me wrong , I love every Japanese dishes that I've eaten so far and adding more seasoning to your own homemade version to suit your own palate makes you a happy camper . I've made half of the recipe , used different veggies I had on hand and instant udon instead of dried udon . * Boil dried udon 1 minute shorter than the suggested cooking time or if using instant udon , blanch for few seconds , drain well and set aside . *Cut lettuce into 1 x 2 1/2 -inch strips , cut scallions diagonally , separate the white and the green part . Divide the vegetables into 2 portion . 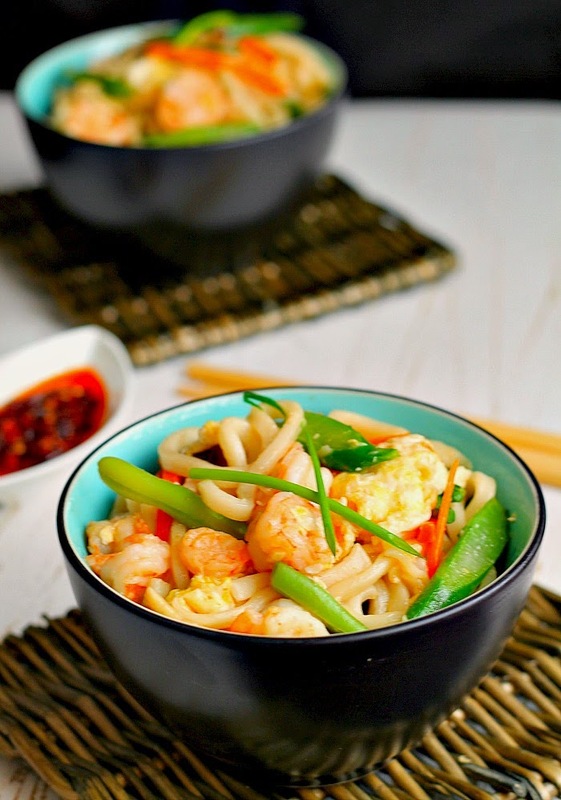 The author recommends to cook two servings at a time as adding too many ingredients to a heated wok will slow down the cooking process . * In a wok or a large skillet over medium heat add 1 tbsp oil , add half of the shrimp and cook for about 4 minutes . Add half of the garlic and the white part of the scallion and cook for 20 seconds . Transfer to a bowl . Add more oil and when it is hot , add 2 eggs to the wok , turn up heat to medium high and give eggs several large stirs, breaking the yolks and briefly cooking the eggs . When the eggs are fluffy but still undercooked , transfer to to the bowl with the shrimp . Turn down heat to medium , add one portion of the vegetables , cook , stirring from time to time until they are wilted . Add half of the udon , stock , black pepper , salt and soy sauce . Cook the mixture , stirring from time to time until sauce is almost absorbed . Adjust taste and add more seasoning , if desired . 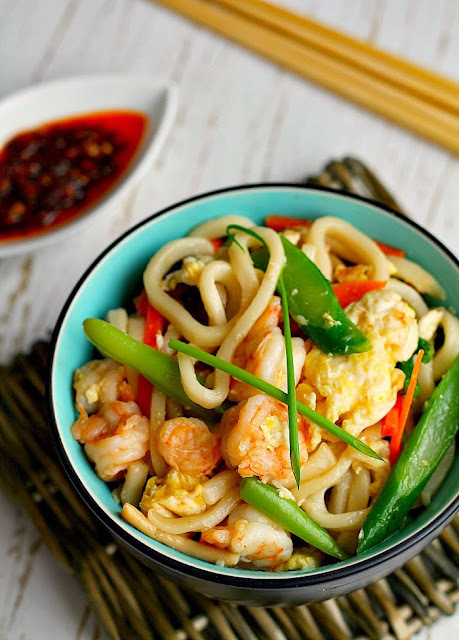 * Add the cook shrimp and eggs , the green part of the scallion to the wok and stir mixture until well incorporated . Transfer to a large platter and keep warm while you do the remaining half of the ingredients . I think your noodle dish came out just the way I like it. I'm just surprised at the inclusion of lettuce, very interesting. I must try it "someday." P.S. The last time I went to the library, they were having a book sale. 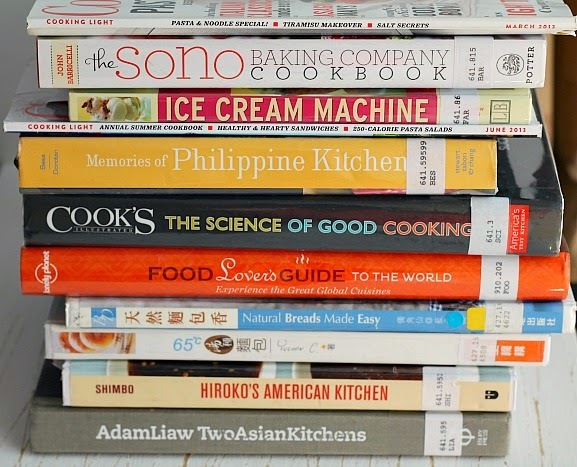 I bought 8 boxes of cookbooks! The one good thing about that was, I didn't have to carry them all back! Louise , gahhhhh thousands of cookbooks ?! Its like having your own library ! Thinking about your cookbooks just makes my mouth water lol Re lettuce , sometimes I use it when making stir fries . ps. nice to see you back!